Recently, Adobe gave us a sneak peek about the new Master Properties feature, coming soon to Ae CC2018. This is a great new feature which will be useful for many things in After Effects and which is going to greatly improve everyone’s workflow. 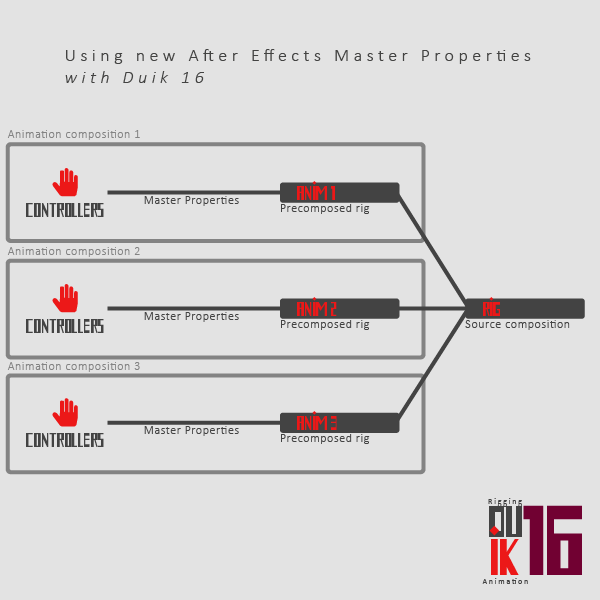 With Master Properties and Duik, you will be able to use one single rigged composition to create as many animations as you wish, in one single After Effects project! Without duplicating the rigged composition, which will be some kind of reference, you will be able to use it as a precomposition in several animation compositions. This means you will be able to easily adjust the design or even the rig without losing the animation! It also means you can easily animate several shots in the same project, without duplicating the rig (and all its precompositions). Also, Duik will let you « extract » the controllers outside of the precomposition in a single click, to quickly begin your animation! This will be available soon in Beta test for our supporters (a bit after the public release of this awesome update of After Effects), and then in the public release of Duik 16.